The first Vanguard Championship of the Standard format ended three hours ago, with tournament winner Grapha clawing their way to the top of the 1st Vanguard TraCaider CS with a Kagerо̄ deck built around Dragonic Overlord and Waterfall. Second place was taken by Tandou with a Nova Grappler deck running Perfect Raizer, Maximum Raizer, and Asura Kaiser, and third place taken by Guld playing a Soul Saver-Alfred deck. Fourth place is currently unreported. Decklists for the top 3 are transcribed below. The tournament carried a maximum capacity of 64 participants, making it the largest Standard-format tournament until the Sukacat CS surpasses it this June. Immediately following the first booster set's launch less than 48 hours ago, a number of Nova Grappler decks had been topping in the first shop tournaments of Standard, leading some to question if we wouldn't see Novas set the tone of the format. Instead, the pro scene finds itself in familiar territory--kneeling once more before the might of the Overlord. The overall image of Grapha's deck is to apply early game pressure with high-power Dragonic Overlord swings that gain increased Critical from Dragonic Gaias, restanding to rack up damage if the opponent doesn't guard the initial attack and then close games out with Waterfall's Sentinel-denying soulblast skill. Every grade 2 in this lineup can retire an opponent's rearguard to power up Raopia, with Berserk Dragon being the ideal ride for its vanguard circle-exclusive draw effect. The grade 2 that will likely draw the most criticism in this list is Spillover Dragon, which has drawn some ire for going into the soul as part of its cost, a net -1 to incur a -1 against the opponent. However, when compared to its immediate alternatives Dragon Armored Knight and Prowling Dragon Striken, Armored Knight distracts from the overall strategy of layering Force Markers on the vanguard circle while Striken becomes redundant in a deck that runs Gaias. Some prefer that redundancy as a way of making Overlord hit 3 Critical early without any trigger checks, but this is counterblast-intensive and means sacrificing many early uses of grade 2 skills like Berserk or Bahr. Grapha's decklist is counterblast-intensive too, but because every counterblast that results in a retire can be refunded through Aermo's countercharge, and Waterfall's own on-ride retire skill will also cause Aermo to resolve, there's more flexibility in skill use. Although this isn't directly relevant to the deck list, it's worth noting that Tandou was third place in the 2017 World Grand Prix Japanese national championships, playing a Deletors. Their decklist will appear the strangest of these three, even to veteran cardfighters. 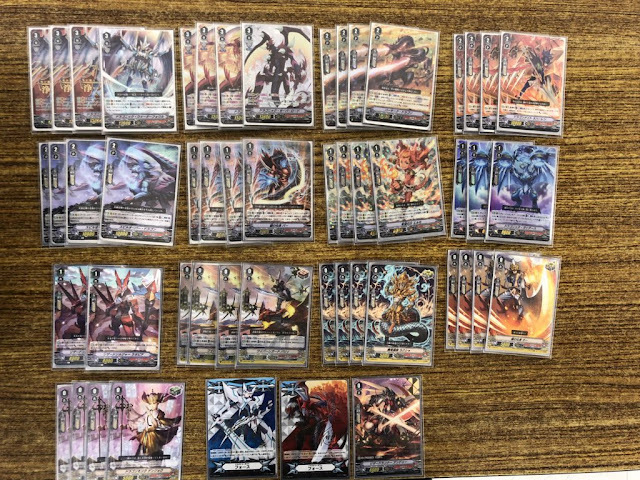 Immediately following the start of Standard proper, a groundswell of Nova Grappler tops has taken hold in Japanese shop tournaments; the past 48 hours have seen multiple Nova decklists running just 11 grade 1s shared to Twitter, 2 less than the average for most professional decklists, and 1 less than even Neo Nectar has ever run. Cutting grade 3s and 2s has been common practice at different points in Cardfight!! Vanguard's history for a variety of reasons ranging from ride chain support to direct searching, but even Glendios never ran less than 12 grade 1s. The reason for the cuts has little to do with the printed skills of these cards and everything to do with the changing game mechanics behind Vanguard. As the first Accel clan of the Standard format, Nova Grappler has a necessity to fill all front row circles beginning from its third ride to maximize its offensive output and take full advantage of the +10ks given to front row. Rearguards that rise to at least 17/18k or greater unboosted like Battledore Fighter and Maximum Raizer have the most synergy with the Accel Gift for being able to make standalone 28k lines. If those rearguards get retired in either the Kagerо̄ or Royal Paladin matchups, they need to be replaced immediately. 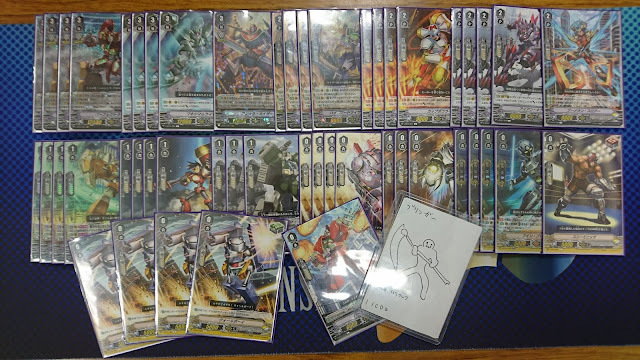 Many have found Nova Grappler's grade 1 support out of V-BT01 to be lacking, so few miss the Transraizers and Death Army Guys they've cut to make room for Iron Killers, Battledore Fighters, and Maximum Raizers. On top of all this, more grade 2s and 3s increases the chance of Asura Kaiser's skill meeting its check timing, while grade 1s contribute nothing to that. Overall, cutting 2 grade 1s means taking a ~6% loss in probability to have a grade 1 in the opening hand in exchange for securing much of the deck's mid- and endgame consistency. In Tandou's case, their list stands out for not running the popular Burstraizer, which in early testing was one of Nova's most important attackers. Instead they run both Iron Killer and Cup Bowler, two cards that are functionally the same as 14k attackers that become 24k on Accel circles, but in the case of Cup Bowler the card allows the use of Rocket Hammer Man as a 13k booster that can make a 27 column--a 15k guard versus Royal Paladin and Kagerо̄, or a 20k guard versus Oracle Think Tank and other Nova Grappler decks. Cutting Burstraizer also frees up the soul for Hammer Man's cost. Guld's Royal Paladin deck immediately stands out for using 3 Conjurer of Mithril. Most shop tournament Royal decks have kept Mithril to 2 if they've run the card at all, with others instead favoring the costless Trial Deck version of Jauron. While Mithril takes away a soul for the Soul Saver turn, it's a versatile card for being able to search out Akane into Pongal and immediately replace that lost soul. The deck's overall image is to open the game on Alfred, vanilla call Blaster Blades from deck with Alfred's counterblast to conserve hand, soulcharge off of Pongal, and use the deck's field swarming and power gain to push the opponent into the range where Soul Saver Dragon's Holy Charging Roar can win the match with +15k to all units. 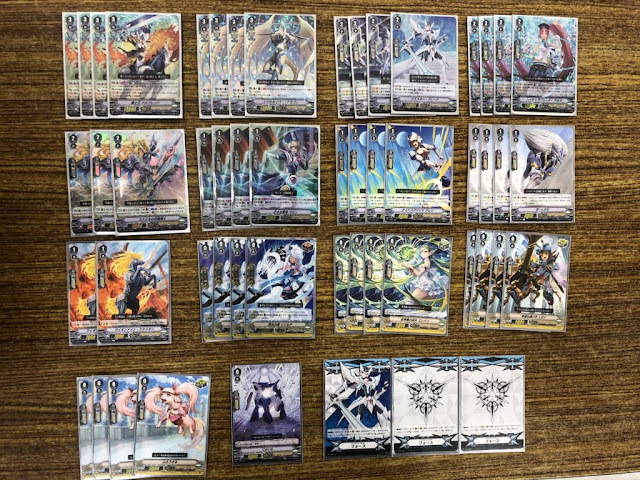 It's likely Guld ran into problems versus Tandou's deck because the go-to strategy for the Nova matchup in early theory was to drop the SSD gameplan and use Blaster Blade calls to repeatedly retire front row units, wounding both the Accel strategy and Nova Grappler's restand skills as a whole. Royal Paladin is supposed to focus on Burstraizer in this matchup, but that doesn't work when Burstraizer isn't even in the deck and the units are more easily replaced. Grapha won four boxes of V-Booster Set 01: Unite! Team Q4, Tandou won three boxes of the same, and Guld walked away with two. The unreported fourth place cardfighter received just one box. Entry at the TraCaider CS cost 1000 yen per person, with the tournament running from 11:20 AM to 5:00 PM Japanese Standard Time. The event consisted of 5 rounds of best-of-one Swiss pairings, followed by a 4-round cut to top 16 played in best-of-three. Additional information like clan usage and final participation numbers has not yet been published. The TraCaider CS will be followed up by a second event on June 30th. The VGCS tournaments are a series of unofficial tournaments organized by fans and cardshops in Japan. Unlike Bushiroad's official tournaments, most VGCS events are done using a best-of-three, Swiss tournament model. Turnout is typically 70-80 persons, but some events see 100 or more participants, all of whom compete using pseudonyms and internet handles rather than their real names as in official events. The VGCS model of fan-organized play has caught on internationally as an alternative to Bushiroad's model, embodied in the United States through the ARG Circuit series.